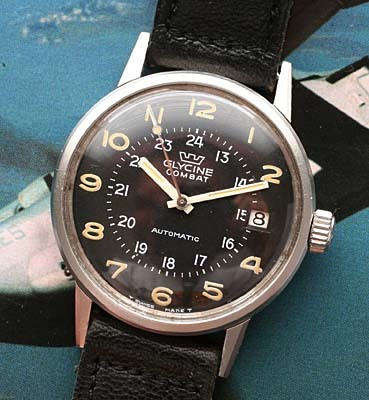 This vintage Glycine Combat is the only such example I have come across. I have read however that this model was produced in limited numbers in the 1960s and production could in fact have only totalled about 100 or so. Glycine makes a modern reproduction of the watch and uses the name for a complete line of watches under the name Combat, however this is the original. 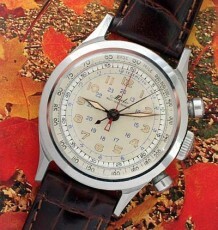 Glycine military watches have become quite sought after since the Glycine Airman has become so popular. The dial is the iconic flat black layout with 24 hour numerals on an inside chapter as you would expect in a military watch. The luminous hour markers are aged Arabic numerals that contrast nicely against the black background and add to the vintage charm of the watch. 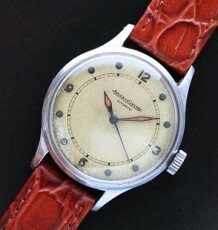 The dial is actually in near mint condition and the refelctions that you see in the photo appear to give it a redish tint in spots. The watch is fitted with a Glycine branded ETA movement which was just serviced by my watchmaker and is keeping excellent time. 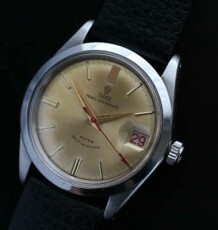 Note the original thatched pattern of the genuine vintage Glycine crown. 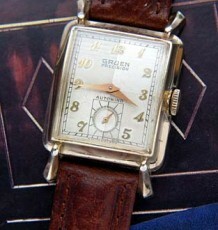 The watch measures 34 mm wide by 42 mm long and is supplied on a high grade black leather strap.